This September, our new colleague Annelies travelled to Nairobi Kenya to meet WorldLoop’s partners and supporters. Her one week adventure was an inspiring experience for her! Our friends from the WEEE Centre warmly welcomed her and showed her around. She visited the learning centre and the dismantling centre, where she could appreciate the work process. In addition, she visited the battery workshop that is currently under construction. Last June, a workshop on battery assortment and storage was organised in the WEEE centre, in collaboration with Stibat and Bebat. Read more about it here. During this one week mission, Annelies met with Joe Varrengia, CSR director of Arrow Electronics, responsible for the new digitruck that is built in Tanzania and transported to Kenya. This digitruck stay in different neighborhoods of Nairobi, and will be a learning centre for awareness raising and for having a first acquaintance with digital technology. Annelies also had the great opportunity to visit the Ngara market. 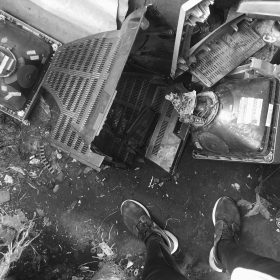 A part of the market welcomes the informal e-waste and repair market. When IT devices stop functioning, they can still maintain value. Each device contains material that can be used in new production, including plastics, aluminium, gold, silver, copper, palladium, platinum, etc. Because of the lack of a legislative framework, the informal sector has developed its own market. Unfortunately, informal workers do not have the appropriate tools to dismantle e-waste and extract those valuable minerals. Like many countries, Kenya lacks the necessary infrastructure, awareness and legislation to promote and enforce sustainable recycling practices that focus on optimal resource recovery while ensuring worker safety and environmental protection. WorldLoop offsets those negative effects by supporting the WEEE Centre and initiatives such as the digitruck for e-waste learning and training.